Rich earned a PhD from the University of St. Andrews and is the author of a variety of popular and scholarly articles, reviews, and interviews in a range of magazines and academic journals. He has illustrated two children's books, What is a Sea Dog? and Women and the Sea and also Ruth! He writes and illustrates a quarterly column titled “Animals in Sea History” for Sea History magazine, is the Series Editor for "Seafaring America," which is a collection of books on the sea for University Press of New England, and he edits the online reference "Searchable Sea Literature." Rich has been sailing on tall ships for over twenty years, traveling throughout the North Atlantic and Pacific Oceans as both a teacher and a sailor. 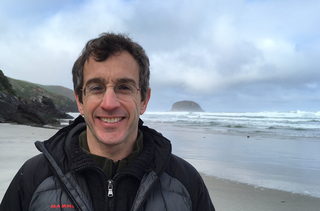 He is a visiting associate professor with the Sea Education Association (Woods Hole, MA), and is a fellow of the Goodwin-Niering Center for the Environment (Connecticut College) and a fellow of Rachel Carson College (UCSC). In 2007, he sailed alone across the Atlantic in a 28' sloop from Portland, ME, to Lisbon, Portugal (he was aiming for Scotland). He lives in Mystic, CT, with his wife and daughter. He is represented by Russell Galen.